Looking for a Used Accord Crosstour in your area? CarGurus has 287 nationwide Accord Crosstour listings starting at $4,990. 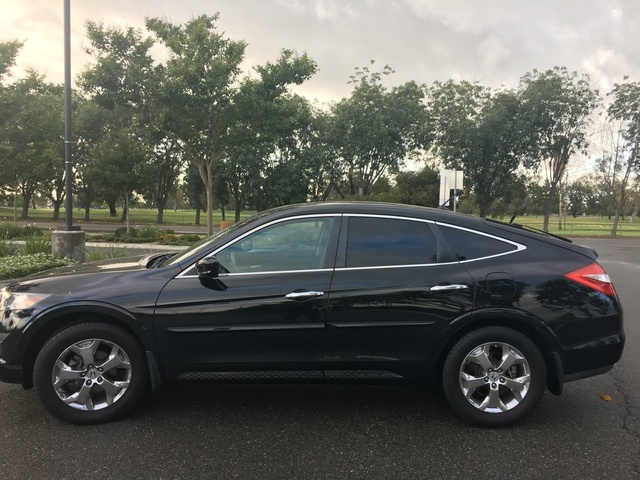 A peppy V6, plenty of cabin room, sedan-like road manners and available 4-wheel drive complement quasi-luxurious appointments and improved mileage to make the 2011 Honda Accord Crosstour an impressive family automobile. A lofty MSRP, poor rearward visibility, a small cargo area and an offbeat design that jars the senses but knocks few socks off might keep the 2011 Accord Crosstour from its true potential. It looks kind of funny and it doesn’t tote much stuff, but Honda’s 2011 Accord Crosstour moves out pretty well, handles almost as well as a sedan and offers more than its share of standard goodies. A hefty price tag, however, and what can be an off-putting design only result in an Accord with an attitude. Cheaper, more utilitarian hatchbacks and crossovers are out there and should get a look-see before anyone does a deal on the Crosstour. When the looks, power and handling of the Honda Accord sedan and coupe aren’t enough, well, then there’s the 2011 Accord Crosstour. This 4-door, 5-passenger swan/troll offers considerably more cargo area than its sedate siblings, yet retains the punch, prestige and panache common to the Accord name. However, a quirky design, with its consequent controversy, has reviewers in a classification quandary, with some calling it a hatchback and others a crossover. Either way, the Crosstour offers less cargo area than most of its peers at only 51.3 cubic feet with the rear seats folded, but does stand tall at 65.7 inches, 7.6 inches taller than its sedan siblings, though offering the same 6 inches of ground clearance. Though a bit limited, payload-wise, this peculiar hatchback’s increased height means plenty of headroom all around for taller passengers. Rear-seat legroom, at a premium in sedan and coupe variations, is also laudably commodious in this Accord-on-steroids. Meanwhile, small improvements over the 2010 debut trims include an engine tweak for 1 mpg in extra fuel economy and a more convenient placing of the climate-control buttons. Again offered in two trims, the base EX and the high-end EX-L, with the “L” signifying Luxury, the 2011 Accord Crosstour is delivered with standard front-wheel drive (FWD), loads of standard comfort and convenience features and a potent V6 powerplant. The EX-L is additionally available with Honda’s well-wrought Real Time 4WD (four-wheel drive), and an optional voice-activated navigation system results in the EX-L w/ Navigation sub-trim. Both trims also sport alloy wheels and a chrome grille. All of this doesn’t come cheaply, however, and a base MSRP of around $30,000 leaves a host reviewers and consumers wondering whether this beefed-up Accord’s marginal utility is really worth its similarly beefed-up cost. Touted as well-mannered and a hoot to drive, the Accord Crosstour, though indeed smooth and agile, fails to impress as a true crossover. Subaru’s traditionally adept Outback and Volvo’s well-wrought V50 are each less expensive and far more utilitarian than Honda’s controversial offering, while the Toyota Venza continues to impress and delight those in the market for a state-of-the-art crossover that combines the attributes of a roomy sedan and a midsize SUV. Both the 2011 Accord Crosstour EX and EX-L are equipped with a performance-oriented 3.5-liter V6 engine that’s mated with a competent 5-speed automatic transmission. This combo puts out 271 hp at 6,200 rpm and 254 lb-ft of torque at 5,000 rpm, good enough for a class-average 7.5 seconds from 0-60 in one acceleration test. 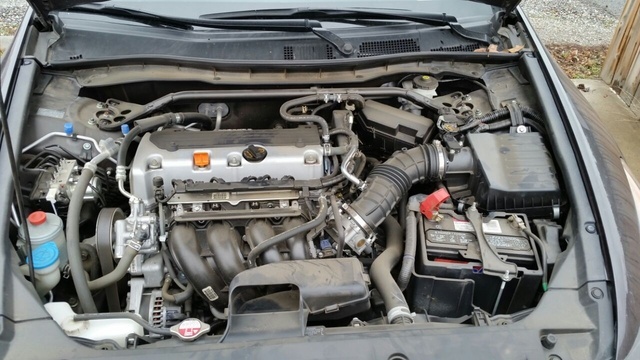 An EPA-estimated 18 mpg city /27 highway can be expected from the FWD Crosstour trims and 18/26 from the available EX-L 4WD trim as a result of the six-banger’s variable valve timing (VVT). Towing capacity, meantime, is maxed out at a paltry 1,500 pounds, and even that demands a dealer-installed trailer package. The Crosstour’s 4WD system is managed by a mechanical center limited-slip differential and features what Honda calls “Real Time 4WD.” In this semi-unique configuration, actually a glorified all-wheel-drive (AWD) system, when slippage is detected in the front wheels, power is automatically transferred to the wheels that grip – front and/or rear – for added traction in slippery conditions. Be advised that, as with any AWD-equipped vehicle, the Crosstour is not designed for serious off-road use. Most reviewers find the 2011 Crosstour to accelerate with admirable alacrity. The 5-speed automatic is noted as silky and responsive by a majority of reviewers, though a couple of reviews describe a sometimes disconcerting hesitation evident in merging and passing on the highway. All reviewers claim the six-banger to be quiet and refined, with most noting at least a tolerant nod toward the fuel budget, especially with the added mileage evident this model year. Both 2011 Accord Crosstour trims ride on a modified Accord sedan chassis. Its admirable ride comes complements of a 4-wheel independent suspension, with a double wishbone front setup, front and rear stabilizer bars and multi-link rear suspension. The base EX trim sports 17-inch wheels, the EX-L rolls on 18-inch wheels, and all, including the EX-L 4WD, are delivered with all-season radial tires. Ride comfort is described by most reviewers as better than average, though nearly all caution that this unique crossover lacks the composure of its sedan and coupe siblings. At least one review suggests that large bumps can be duly noticed by occupants, but not to the extent of actual discomfort. The Crosstour’s steering is noted by the majority of reviewers as competent for its size and purpose, though sporty it’s not. Braking, meanwhile, has been described as less-than-perfect by more than a few reviewers, though not enough that drivers feel unsafe. A predilection to nosedive under even ordinary braking conditions will let drivers know that this otherwise amenable hatchback is no sedan. Bottom line is that virtually all reviewers feel the 2011 Crosstour to be worthy of the Accord name, but warn that shoppers shouldn’t expect the same nimbleness and agility common to the smaller, less weighty sedan and coupe versions. The Accord lineup has gained the reputation of a nicely balanced blend of affordable ambiance and near-luxury appointments. The 2011 Accord Crosstour is no exception, with the EX trim offering such standard cabin appointments as cloth upholstery, power-adjustable front seats – eight way driver’s seat and four-way passenger seat – and front and rear floor mats. The split-folding rear seat is complemented by a folding center armrest with storage, and such niceties as dual-zone climate control, as well as power windows and power-adjustable, heated outside mirrors are also standard. Standard cruise control, telescoping tilt-wheel steering with mounted cruise and audio controls and a 360-watt audio system that features a 6-CD changer, seven speakers including a subwoofer and auxiliary MP3 audio input round out the goodies delivered with this base trim. The Accord Crosstour EX-L boasts standard 18-inch alloy wheels and a power sunroof, as well as such traditional luxury amenities as leather upholstery and leather and simulated alloy trim accents on the center console, shift knob and steering wheel. Additional standard goodies in the flagship trim include multi-level heated front seats, reverse-tilt outside mirrors and memory for two driver's settings. Entertainment extras, meantime, include XM satellite radio and a USB connection, with phone pre-wiring and Bluetooth hands-free phone technology also standard. Options for both the Accord Crosstour EX and EX-L are all dealer-installed and include underbody spoilers, 18-inch chrome-look wheels, a roof rack, cargo organizers, backup sensors and remote engine start. A factory-installed, voice-activated navigation system is available for the EX-L trim, thus turning this high-end trim into the EX-L w/Navigation sub-trim. The navigation package comes with a rear-view camera system, as well. The 2011 Accord Crosstour cabin is described by most reviewers as comfortable enough, with plenty of standard gizmos. Nearly all, however, note that some low-rent materials and hard plastic surfaces hardly reflect this quirky crossover’s premium price. Additionally, despite an alleged re-positioning of some climate control functions for 2011, many reviewers still find this hefty Accord’s center stack to contain an intimidating number of buttons. Finally, rearward visibility is dramatically curtailed due to a raked roofline and wide rear roof pillars, with more than one reviewer noting that the rear-view camera included with the navigation screen will often come in handy. On the positive side, legroom is described by reviewers as vast, even in the rear seats, and a number of reviewers comment on the Crosstour’s comfy seats and large front and rear doors that make entry and exit easier than is usual in midsize hatchbacks. Quietness is, apparently, in the ear of the beholder, with opinions about evenly split among reviewers as to just how much noise this premium-priced crossover/hatchback ought to allow. Standard safety equipment in the 2011 Accord Crosstour is fairly traditional. Four-wheel antilock brakes (ABS) with emergency brake assist and electronic brakeforce distribution are delivered across the lineup, as are traction and stability control. Dual front side-mounted airbags, front and rear head airbags and front head restraint whiplash protection also come standard in both trims, as do daytime running lights, front fog/driving lights and a remote antitheft alarm. The National Highway Traffic Safety Administration (NHTSA) gives the 2011 Crosstour 4 stars in rollover safety testing using its current, more stringent standards. The NHTSA gave the 2010 trims 5 stars in front and side impact testing, but those results came from the older methods, with no data for impact tests on the 2011 trims. The Insurance Institute for Highway Safety (IIHS), meanwhile, rates the 2011 Crosstour as Good, its highest score, in front and side impact testing, while roof strength (rollover) tests garnered a second-worst Marginal rating. If there’s one common complaint among owners of the 2011 Accord Crosstour, it’s the fact that rearward visibility is all but non-existent. Most owners and virtually all reviewers suggest opting for the navigation/rear-view camera system, if economically feasible. Additionally, a few owners complain of more-than-necessary engine noise during hard acceleration, while others bemoan the lack of serious cargo space or of an available power liftgate. The button-heavy center stack still irks several owners, with the lack of available turn-signal-integrated outside mirrors also causing some head-scratching. 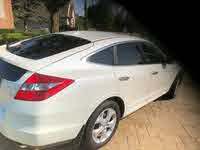 The 2011 Accord Crosstour’s styling, though unconventional, seems to garner more yeas than nays from owners. Kudos, meantime, go out to the roomy cabin, potent engine and improved gas mileage. As is traditional, Honda reliability gives its weighty hatchback a boost in owner opinion, with overall workmanship gaining further positive owner comments. Despite its hefty price tag, a majority of Crosstour owners feel the extra utility and appointments to be worth the added financial outlay. What's your take on the 2011 Honda Accord Crosstour? Snibbor Bought one new in May 2011. Cargo space is limited with design of interior trunk limiting what you can carry even with the seats down. Would love to have a power liftgate miss that when my arms are full. Have to lay everything down to open it. Paint is horrible. Mirrors and plastic grill changed colors...from solid black to mottled. Honda won't fix it either. 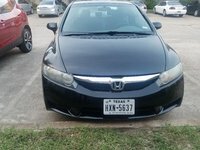 Honda customer service/care is lacking...I'll not buy another Honda because of that. Otherwise I like the vehicle...just not the service after the sale. Have you driven a 2011 Honda Accord Crosstour?